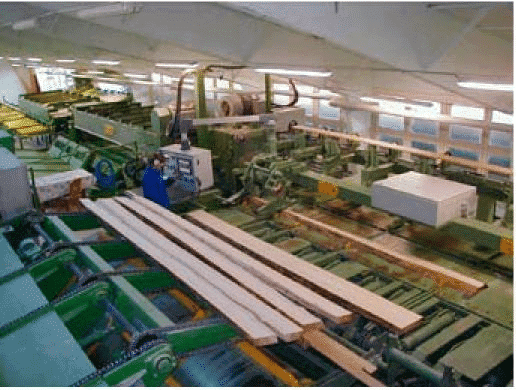 In a saw mill, the tree trunk is stripped of its bark and then separated into planks using a gate saw, circular saw or band saw. These planks still have a so-called wane (waney edge) on their narrow sides – the original surface of the circular tree trunk. The wanes should be removed in the following side trimming system. Depending on the position of the plank in the original tree trunk, the wane can be flatter or steeper and the plank is broader or narrower. If as large a yield as possible needs to be achieved during side trimming, the width of the wane must be determined, so that this can be sawn off at the appropriate width. If too much is sawn off, valuable material is wasted; on the other hand, if too little is removed there are still residues of wane on the finished board. The company Esterer WD from Altötting ini Germany is using the optoNCDT1401 laser sensor for this task. and are measured. Every 30cm to 50cm, an optoNCDT 1401 sensor is positioned, which has a 200mm measuring range and measures the profile of the cross-fed plank. As standard, the measurement is made from above. The side trimming system can also be fitted with optical sensors on the top and bottomside if required. In this way, any position of the planks – wane at the top or bottom – is possible.